Yarn: Stitch Nation Alpaca Love in Cobblestone, scraps of bernat in brown and I can’t remember what the white yarn for his horns is or the fuzzy white yarn for his beard is. Notes: Followed the pattern as written. Alpaca Love is a great yarn I really liked working with it. 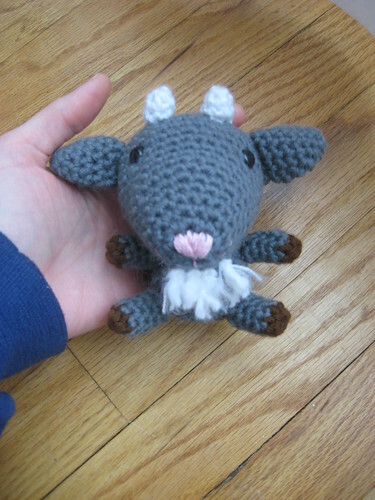 It is an aran weight yarn so Goatimer is a bit bigger. Not sure what it is about this pattern but it is killer on my hands, I think I am clenching too tightly when I am working on the little body parts. I think he turned out even better than the first one and of course Little Man wants one now. I have a feeling it will be another year if I do make one. Hubby loves him and was super happy that I made him and he even named him. Yay! Very cute goat. That’s the best kind of gift, something made with time and love that is totally unexpected. Oh, it’s tough to give presents to husbands, they either don’t know what the want or they want some fancy computer gadgets you know nothing about… ^^ A handmade gift is a great idea!